2:00 pm Time is slipping by and the updates to this site are getting less frequent as Tara improves and is adjusting to life outside the hospital. Tara and Josh traveled to San Francisco last Friday to attend a Giants baseball game. They are becoming more active in the activities at church. Tara continues to attend her therapy sessions at the hospital. Tara and Josh are working on the best way to say Thank You to all of the people that have come to this site and who have prayed for them and donated time and money to help them. We hope to have that ready here soon, along with a video of the recent interview at their church. This weekend the Moonlight Pond Tour that will benefit Tara's Recovery Fund. Shanna and Chris Schriner, owners of The Pond Shack are have organized their annual moonlight pond tour for this Friday and Saturday evenings, October 1st and 2nd. This year there are 19 ponds on the tour! They are located in San Jose, Campbell, Los Gatos, Milpitas, Saratoga, Mountain View and Redwood City. Tickets for this wonderful and enchanting evening are $15.00 and can be purchased online at The Pond Shack or in person at The Pond Shack in Mountain View. In addition to the Pond Tour, a generous donor has provided the Pond Shack with a Super Bowl XVI 49er Team Signed Football which is being auctioned on ebay. All proceeds from the auction of the football will go to Tara's Recovery Fund. The football is signed by most of the team members of the San Francisco 49's that year. We already have a very generous reserve bid for the item that can be viewed at Football on ebay. 8:30 am Tara continues to improve. She and Josh participated in both services at Calvary Church yesterday, as part of the sermon. The sermon centered on having the right perspective in life, and Tara and Josh now have an opportunity to view life from a unique perspective. The church did an excellent video interview of Tara and Josh where they discussed their impressions of what has happened to them and how grateful they are to be alive. We will try to make the video accessible through this website in the next few days. Members of the church's quilting guild presented Tara and Josh with a beautiful quilt that symbolized the prayers that are continuing to be said for their recovery. We will let you know via email if we can make the video of the interview available for viewing. 8:30 am Tara continues to improve. She continues to attend her occupational and physical therapy sessions. She is still in wait-list status for out-patient speech therapy. While Tara's language skills are good, speech therapy focuses on other tasks like communication and computer skills. While her progress thus far has been remarkable, she is still in a recovery mode and will be for quite some time. 6:00 am Tara continues to improve. Her attitude continues to be very positive and determined, which is helping her recovery. She is often recognized when she and Josh go places because of the media coverage that her story has received. People approach her and Josh and offer their thanks and tell them that they are continuing to pray for her recovery..
12:15 am Tara continues to do well in her therapy sessions and her strength and abilities are increasing every day. Not much more to report today, so lets diverge and tell someone else's story. We would like to say a very special thank you to Jenny Jordan of Utah who has helped us with our website and fundraising ideas. Jenny contacted us via email a week after the accident when we were first starting this website and offered advise and many very good ideas. Her help and assistance came at a time when we were deep in grief, unsure of the future and grasping to find ways to help. Jenny and her husband Wes had needed to start a website of her own last year after she was diagnosed with leukemia. She also had no medical insurance and when she approached doctors and hospitals to find out how she could get therapy she was basically told "tough luck, go away" because they did not have any means to pay. Faced with this reality, Jenny and Wes decided that rather than have Jenny die, they would raise the needed money by fundraising. They and many of their friends worked very diligently with firm resolve and raised the $170,000 needed for her first course of chemotherapy. Thankfully, the cancer went into remission for awhile. Unfortunately, Jenny has just been diagnosed this two weeks ago with a brain tumor that will require surgery. Even faced with this challenge and disappointment, Jenny continues to call us and offer her help to us. You can read about Jenny at her website JennyJordan.net. Tara and Josh and their families want to say THANK YOU Jenny, for your help and assistance, and we will pray for success in your upcoming surgery. 9:00 pm We hope everyone is having an enjoyable Labor Day weekend. There is not much special to report. Tara and Josh have been settling in. Tara and friends made a trip to the local Ikea store yesterday to look at household items. Tara is looking forward to going to church today. 9:00 pm Today is the 3 month anniversary of the accident in Utah. There is nothing special to report about Tara's progress today. Last July 19th we announced that Shanna and Chris Schriner, owners of The Pond Shack are organizing their annual moonlight pond tour which will benefit Tara's Recovery Fund this year. The tour will be October 1st and 2nd. Tickets will go on sale tomorrow and we will have more information for you about this wonderful and enchanting evening. 8:00 am We apologize for the two emails yesterday. Tara and Josh decided yesterday morning to appear on the CBS Early Show, but as the day wore on, Tara become concerned about whether she could do it, and then decided late in the day that she should not at this time. While Tara has made very large strides in her abilities these past few weeks, she is still aware of and respects her current limitations. 6:30 pm Cancelled!! The Early Show segment for tomorrow has been cancelled. Tara is not feeling that she can handle being on television at this time. We apologize to all of her supporters for the misinformation and to CBS News who worked very diligently to make this happen, especially to Katherine Milofsky. As reported earlier, Tara and Josh have been trying to establish a routine that will facilitate her ongoing therapy, and at this time, things that are out of the ordinary are stressful. 2:30 pm GOOD NEWS!!! You will be able to see Tara and Josh interviewed on CBS's Early Show tomorrow morning, Tuesday, August 31st. The segment featuring Tara and Josh will air sometime between 8:15 am and 8:45 am with the targeted start time being 8:30 am which will air on local CBS stations across the country in each time zone. CBS is sending a camera crew to Tara's grandfather's home to film Tara and Josh. The Early Show's anchor will interview them live from New York City. 2:00 pm Tara attended church this morning for the first time since the accident. She and Josh went to Calvary Church in Los Gatos, where they net. Tara says it was wonderful to see many of her friends and to have the ability to thank all those that have supported her and prayed for her recovery. Both Tara and Josh want to volunteer their time to help with the High School ministry at the church. the oldest, most widely used free online service connecting patients to friends and families. Tara and Josh are looking forward to returning to a bit of normalcy and enjoying the private joys of newly married life. They have been deprived of this simple pleasure by the tragic accident, the long hospital stay, and the media exposure of their story, including this website. They want to and will continue to tell their story because it has inspired so many people, but would like to balance that with their own needs. Because of this, we may update this website less frequently, and transition to updating it only when there is something important to report. If you have already signed our guestbook you will receive an email informing you of any newsworthy events. As Tara and Josh find time they may also update this website themselves and your reporter up to now will become less involved. Please continue to check back as frequently as you wish, and we thank everyone for their continued prayers and support. 8:00 am Tara visited her chiropractor yesterday - Dr. Thomas Osborne at Discover Chiropractic. Dr. Osborne has helped Tara stay healthy for the past eight years. Tara felt better after getting adjusted for the first time since her body was impacted so severely in the accident. 11:30 am Not much new to report this morning. Tara and Josh are settling into their new life. They have received over 550 emails.and guestbook entries in the past few days. They are trying spend time reading them. There are may words of encouragement and hope. There are also many that contain stories of other people that have been or still are in a coma. Several emails are from parents or spouses of other coma patients who say that Tara's story has given them renewed hope for their loved one. There have also been several generous donations to Tara's Recovery Fund. Tara and Josh have also received offers from more television shows to tell their story. 6:00 am Tara and Josh are settling into their new life. Tara returns to Santa Clara Valley Medical Center three times a week for therapies and check-ups. Tara still has a long way to go for a complete recovery, and she is determined to work hard at it. Tara's father took them to Tara's favorite Los Gatos restaurant, Sushi on the Run, for a celebration dinner last night. 1:00 pm We are truly touched and blessed by the outpouring of love we have received as a result of this morning's interview. We have had over 400 emails and guestbook entries so far today and some donations as well. 8:15 am Tara and Josh really enjoyed doing the interview on ABC's Good Morning America show today. 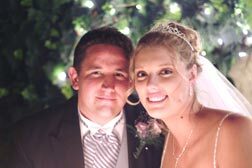 Here is a link to the story Bride Awakens: Newlywed Wakes from Six-Week Coma to Discover She's Married. Tara and Josh want to thank the entire staff at Good Morning America for giving them the opportunity to tell their story on national television, with special thanks to Sabina Ghebremedhin for her diligence and thoughtfulness. 6:00 am Thank you for visiting our site and reading our updates. See the August 23rd update below for an update on Tara's condition, and the August 1st update below for a detailed accounting of the accident. We would like to express our special thanks to all of those that have donated to Tara's Recovery Fund. Please sign our Guestbook if you haven't already. Thanks to everyone who have sent Tara and Josh messages of hope when signing her guestbook or by email. 2:15 pm GOOD NEWS!!! You will be able to see Tara and Josh interviewed on ABC's Good Morning America show tomorrow morning, Wednesday, August 25th. The segment featuring Tara and Josh will air sometime between 7:55 am and 8:20 am with the targeted start time being 8:05am which will air on local ABC stations across the country in each time zone. ABC is sending a camera crew to San Jose to film Tara and Josh. Anchor Robin Roberts will interview them live from New York City. 9:00 am GOOD NEWS!!! Tara is home and she walked out of the hospital yesterday unassisted. Tara and Josh had a relaxing evening last night in their new home. Readers in the San Francisco Bay Area might wish to pick up a copy of today's San Jose Mercury News. Reporter Yomi S. Wronge and photographer Joanne Hoyoung Lee of the San Jose Mercury News did an excellent news article with many photos on Tara and Josh leaving the hospital titled "New Memories Await Couple". Thank you Yomi and Joanne! Tara and Josh gave a press conference as they left the hospital. The local network television and radio stations were there to document the occasion. Here are links to stories and videos. Thank you to the reporters and cameramen and photographers. 4:30 pm GOOD NEWS!!! Tara has been discharged from Santa Clara Valley Medical Center (SCVMC). Look for her story and an interview with Tara and Josh on your local nightly news stations tonight as all the major media covered her discharge and spoke with her. What a wonderful belated three-month wedding anniversary present to the couple. Of the 93 days since they married, Tara has been hospitalized for the entire time but 10 days. She spent half the time she was hospitalized in a coma. She spent a little over a month at the University of Utah Hospital and then was transferred by air ambulance to SCVMC in San Jose, CA. After spending 6 weeks in a coma, Tara said her first words on July 9th and took her first steps on August 2nd. She has been determined since she woke from her coma to meet her discharge goals and be discharged from the hospital. Tara has been actively participating in both physical, speech and occupational therapies and will continue to do so on an out-patient basis. We would like to express our special thanks to all of those that have donated to Tara's Recovery Fund. 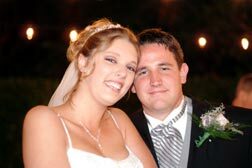 Tara and Josh had no medical insurance at the time of the accident. While it appears that Tara may make a full recovery, at this time it is still unknown what the total costs of this accident will be. We feel extremely blessed that Tara is doing so well at this time. So far she has recovered further and faster than anyone's expectations. This is an affidavit of her will and determination, absolutely the best medical care and the power of having thousands of people praying for her. Thanks to everyone who have sent Tara messages of hope when signing her guestbook. 6:00 am Tara and Josh had a wonderful time on their "date" yesterday. Tara said that is was great to get out of the hospital and have a bit of a "normal" life for awhile. They went to the Spiderman 2 movie and dinner at Outback. 9:00 am Today is Tara and Josh's three month wedding anniversary. Tara has an eight-hour day pass to leave the hospital so that she and Josh can go on an anniversary date. They plan on going to dinner and a movie. Here are a few more wedding photos to celebrate their anniversary. My name, Chizuru, means "1000 cranes" in Japanese, and that is a symbol of "peace and recovery". In Japan, we make 1000 paper cranes to wish a sick person get well. I personally do not know her but I hope she will recover soon. Chizuru has made over 400 paper cranes for Tara so far and said a prayer for her with each one. Tara and Josh and their families are grateful for all those that have prayed for Tara's recovery. Tara's rapid recovery is a testament to Tara's determination, the power of prayer, and the skills of her medical providers..
9:00 am Nothing new to report this morning. Tara is doing fine, and her physicians say that her recovery has been remarkable. We still do not have a definitive discharge date yet. It seems that there are no openings in the out-patient occupational therapy sessions, but Tara is already scheduled for in-patient occupational therapy. The hospital staff is working to resolve this. Josh has been busy trying to organize the cottage to bring Tara home to. Tomorrow is their three month wedding anniversary, and Tara has a day pass to get out of the hospital. So, Tara and Josh are going on a date to celebrate their anniversary. We hope you all have a wonderful weekend. 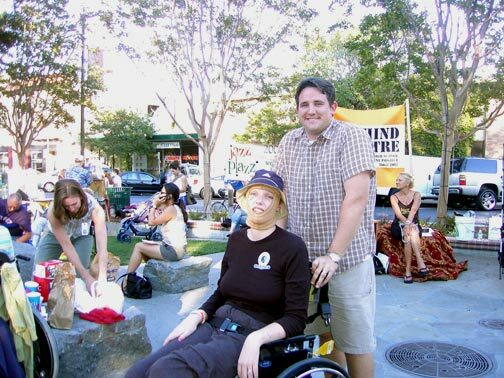 9:15 am On August 12th, Tara took her first outing outside the hospital to a concert in her hometown of Los Gatos. NBC11 news interviewed her and Josh and have posted a video of Tara on their website titled Woman In Good Spirits After Awakening From Coma. Click on Tara's picture to view the video. You may have to hold your Control key while doing so to bypass your pop-up blocker. Thank you to NBC11 for providing such good coverage of Tara's situation! 6:00 am Tara is really looking forward to being discharged. Yesterday, Josh and family and friends moved their belongings into the cottage in back of Tara's grandfather's house where Tara and Josh will be living. Tara will still have out-patient rehab three times a week. 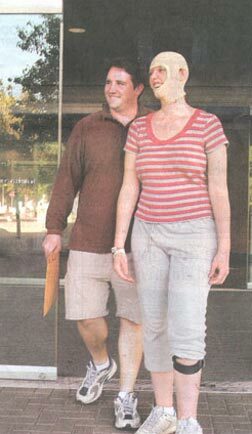 They had planned to set up their new married life in Colorado, but will be doing it here in California for awhile.. One of Tara's discharge goals was to walk out of the hospital and she is walking so well now that she can do that. This is only a few weeks after she took her first steps. I'm so glad your recovery has gone so well. You are an Olympic champion in my book. Last night an American gymnast, Paul Hamm, dropped from first place to 12th after a fall on the vault landing. He bounced back to win the gold medal in the men's all around competition, shocking everyone. This reminds me of your amazing comeback. After a few struggles at home this year, I look to what you have done (and God!!) in a short time and can't help but feel inspired. You remind me to keep perspective and to remain thankful and optimistic. After my faith was rocked over situations I had hoped and prayed for, your recovery renews my faith and belief in what is good and what is God. You and Josh (and your father in his web entries!) have shown goodness and hope in the midst of a tough situation. I am beginning to think you must be a pretty tough competitor also and I feel sorry for the people you used to play basketball against. I hope you can shoot baskets again and do many more things, one hoop at a time. Congratulations on your pending hospital departure and keep up the great work in rehab!! 6:15 am Tara had good therapy sessions yesterday. She says to post the following here from her: Her physicians are discussing the possibility of discharging her earlier than the August 26th date. "Hi everyone. Thanks so much for visiting this website and thank you for your prayers and support. I know that it is everyone's prayers that have helped to let me recover so quickly. I have been reading some of your emails and hope to be able to answer some of them soon. Thank you, everybody!" 6:00 am Josh arrived home from his trip last night, safe and sound. Both Tara and he had BIG smiles on their faces when they saw each other after the 4 day separation. Tara is still on track to be discharged on the 26th, although she said tonight that the doctors might even send her home a few days earlier. We have received several emails from their friends and church members in Colorado who expressed how nice it was to see Josh. We are still trying to schedule Tara and Josh's appearance on Good Morning America which should happen within the next week. Keep checking this status page and we will also send out an email once the segment is confirmed. We apologize for the postponement last week. Tara and Josh got pre-empted by Hurricane Charley. Yesterday the golf tournament had 36 golfers, including Tara's uncle Doug from Arizona and Steve Leonard who drove all the way from Utah. It was a perfect day for golf. Early estimates are that the tournament brought in over $5,000 for Tara's Recovery Fund. Mike Masuda, the Sports & Recreation Ministry Director of Calvary Church who organized the event wrote the following email. I just wanted to be sure to give you a more complete list of those that helped. I so appreciate them!!! Melissa Hammond - helped hang posters downtown with Katy West and also spent an entire Saturday putting flyers on cars in the parking lots of Los Gatos Blvd. She was up until past midnight helping organize prizes and stuffing tee prize bags. She and Alicia Price were a big help with the raffle set-up yesterday, while I enjoyed the day of golf. Barbara Nicewonger - helped get raffle gifts and prizes. Then she and her daughter, Ariana Nicewonger came and helped with registration the day of the tournament. Karuss Edwards, Lauren McElhatton, Teri Lyall, Sasha DeBriere, Matt Cunningham (some of the bridal party) helped with the raffle. Christine Lavazza of Mary Kay - Sponsored a gift as well as came out in support and to take pictures for the Los Gatos Weekly. The Steve Glickman, the mayor of Los Gatos had some great suggestions for contacts and the Vice Mayor, Mike Wasserman made the time to play in the tournament. Ronee Nassi, Executive Director of the Los Gatos Chamber of Commerce emailed the Los Gatos businesses. And thanks go to you also, John, for placing the info on the website!! And of course, thank you to all the golfers that participated and the sponsors that donated and a very special thank you to Miki for organizing the tournament. 6:00 am Yesterday, Josh and Darren journeyed from Colorado to Wendover, Utah, on the border of Nevada, on their trip back to California with Tara and Josh's belongings. Originally, Tara and Josh were going to set up their married life in Colorado where Josh was a youth minister at Summit Community Church in Highlands Ranch. The accident in Utah, when they were returning from their honeymoon, took their lives on an unexpected detour. When Tara is discharged from the hospital next week she will still continue to have out-patient therapies three days a week. An longtime friend of Tara's visited her today, Lauren Malachek and her mother Karla. Lauren and Tara used to live only 5 doors apart in Los Gatos. Tara was thrilled to see her and surprised to find out that Lauren is attending the University of Colorado in Boulder. Tara and Lauren had only been living about 10 miles apart and did not know it. 6:00 am Today, Tara begins what may be her last full week at the hospital. Her scheduled discharge date is August 26th. Josh was able to go to church yesterday at the Summit Community Church in Highlands Ranch, Colorado where he was a youth minister. In the afternoon a party was given where he was able to spend time with friends and the youths that he counseled and ministered. The U-haul is loaded and so this morning Josh and Darren will begin the drive back to California. They expect to arrive in California tomorrow evening. Tee off times begin at 10am. Good luck to all the golfers. Have a wonderful time. 2:00 am Tara had a good day yesterday. It is wonderful to see her progress, and it is apparent every day that she is improving. Yesterday she read many of the thousands of emails and guestbook entries that she and Josh have received from this website. Tara expressed how wonderful it felt to have so many people sending her love and prayers. She says that it is everyone's prayers that have helped her recover so swiftly. Tara made a phone call yesterday to Andy Finlay, the gentleman from Utah that used his pickup truck at the scene of the accident to separate Tara's car from the other burning vehicle (see August 1st status update). Andy saved Tara's life by his action and Tara thanked him for it. They had a very nice talk and Tara expressed that she hopes to meet Andy in person someday soon. Tara has occupational therapy every day that focuses on different "every day" life tasks. Yesterday they went to the work shop and did some crafts. In the photos above you will see that Tara is wearing a "burn pressure mask". Tara had second and third degree burns on her forehead, and had a skin graft performed at the University of Utah Hospital. When skin is burned, collagen in the skin reforms as bundles instead of returning back to the original form of parallel lines. A pressure mask helps to flatten burn scar tissue as skin heals. The mask provides precise pressure over the burn scars so that the scars will stay flat as they're healing, and they'll stay soft as they're healing, The mask is not easy to wear, but it will help to minimize scarring. Pressure masks are custom fitted and are made to conform to a patient's normal body contours, thus limiting scar formation. 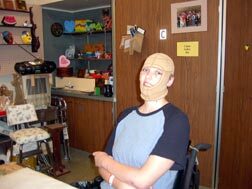 When wearing a facial mask, burn patients must wear the mask for 24 hours a day. Patients are advised to only take off the mask while showering and only leave it off for up to 25 minutes after they shower. Wearing a facial burn mask 24 hours a day applies constant pressure on scars and makes them more pliable, less red and less noticeable. Tara has adjusted very well to wearing her mask, although she says that it is difficult to fall asleep with it on. 8:30 am Tara had a very good day yesterday. She is getting better at walking every day. She is determined that when she leaves the hospital that she will walk out unassisted. Tara has been calling it "release day," and the nurses remind her that it's not a prison. So now she is calling it departure day. Tara's tentative departure day is August 26th. Josh has left town on an adventure for a few days. He and his friend Darren are flying to Colorado today where they will pack Tara and Josh's belongings into a U-Haul truck and will drive it back to California. A special thank you to their friends in Colorado that will see them and help them. Good luck to Josh on his trip. 6:00 am Tara had a very good day yesterday. She did well with her therapies. We apologize to any of you that did not get the message that the Good Morning America segment had been postponed if you got up early to watch it. We will keep you posted via a new e as to when it will be rescheduled. It will probably be Wednesday or Thursday of next week..
10:00 am POSTPONED!! The Good Morning America segment for tomorrow has been postponed until some time next week. We will keep you posted via a new email. The postponement is due to the impending storms hitting the east coast. 6:00 am Tara had two "off campus" adventures yesterday. She left the hospital and went to lunch at a Japanese restaurant near the hospital and in the evening went with four other head injury patients to a "Jazz in the Plaza" concert in her hometown of Los Gatos. She says that it was great to get out and "feel normal". Readers in the San Francisco Bay Area might wish to pick up a copy of today's San Jose Mercury News. Reporter Connie Skipitares of the San Jose Mercury News did another excellent news article on Tara and Josh titled "Accident victim has first outing". Thanks again Connie! Tara's visit to the concert was covered by reporter Ethan Harp of NBC11-KNTV news during their 11pm broadcast. Special thanks to Ethan and his cameraman. Don't forget the next that will take place on Monday, August 16th. The Golf Tournament will be held on Monday, August 16th at the Santa Teresa Golf Course, in San Jose, California. If you would like more information please e-mail Miki Masuda at MMasuda@calvarylg.com or phone Miki at 408-356-5126, x244. Please tell your avid golfer friends about it and we still need some additional corporate sponsors to sponsor holes for the tournament. 3:30 pm Tara walked a lot more today and also stood in place and shot some basketball hoops. Unfortunately, she was disappointed that she did not make her shots. Her arm strength still needs a lot of work. 6:00 am Tara has a good day yesterday. Typical hard work at her therapies. Today she might go on a field trip with a few other patients to get out of the hospital for the first time. We will be sending out an email today about Tara's upcoming TV appearance this coming Friday morning, currently scheduled for between 7am and 8am on ABC's Good Morning America show. Please sign our Guestbook if you haven't already to be sure that you are on Tara's email list. 6:00 am Tara has a good day yesterday. She is walking more and doing better at it. Several weeks ago Tara was fitted for a special pressure mask which will help the burns on her forehead heal with less scarring. The mask arrived yesterday. In order to put pressure on her forehead, it covers much of her face. She will wear it most of the time for the next nine months. Here is a special treat for our readers. Here are some recent photos of Tara. Enjoy her smile! You will be able to see Tara and Josh on live television this coming Friday morning (early) on ABC's Good Morning America show. ABC is sending a camera crew to the hospital to interview Tara and Josh on the show. We will keep you posted here as to the possible time slot. 7:15 am Tara has a good day yesterday. A day off from therapies. Tara made a comment about how frustrating it was to have to learn to walk again, when she used to do runway walking when she modeled. Tara modeled from age 13 to age 16. Her 6'3" stature made it difficult to get some assignments, but she enjoyed the time she did it and was very good doing the runway walk. Here is a link to some of Tara's modeling photos. Tara has several times made the comment that it's a good thing that she is not modeling any longer because she is no longer attractive. We have assured her that despite the burn scars on her forehead and other scars that she is just as beautiful as ever. Tara is pleased that she "schooled" the coma. This week begins another week of intense therapy. Don't forget the Golf Tournament on Monday, August 16th which is only a week away now. 8:30 am Sunday morning, day of rest. Sunday's are "free" days for Tara. She has no therapy sessions scheduled. Josh leaves to attend church. It is one of the few times when he is away from Tara's side. Tara is looking forward to being discharged from the hospital so that she can attend church again. Tara's dad likes the "one on one" time he has with Tara on Sunday mornings. Nothing new to report this morning. Have a great day everyone! . 6:00 pm A physician came in on weekend duty today to see Tara. He had not seen her for two weeks and was amazed at her progress. It is amazing to witness. It is like seeing someone be reborn. A few weeks ago she could hardly move, now in physical therapy she is walking, not long purposeful strides, but tentative slow steps, yet walking nonetheless. A week ago she had a shower in a special gurney. Today she took a shower in a special chair. She told the physician today that she is determined to get out of the hospital as soon as possible. 10:00 am Tara is doing well and had a good day in with her therapies yesterday. Tara talks very well and her speech is excellent. She is still fairly confused about many things and her short term memory is not consistent. This should improve over time. Many brain injury patients must rely on day timers to help them with their daily tasks. 6:00 am Tara walked some more several times yesterday. She is getting more confident with it, and going a bit further each time Her new knee brace is working much better as it is lighter and smaller. Tara is still having difficulties with her short-term memory. The burns on her cheeks, below her eyes, are healing well and the burn across her forehead is making good progress. We want to thank the many friends that volunteered several weeks ago to sit with Tara when we were concerned about her scratching at her wounds. It turned out that Tara got past that stage fairly quickly. The therapists in the Traumatic Brain Injury Rehabilitation Program are outstanding! They have Tara doing many different types of therapies and they are adept at knowing how far they can "push" her to get results. Tara is participating in her therapies whole heartedly because she is looking forward to the day that she can be discharged. Josh is a tremendous support and inspiration for Tara during her sessions. She has physical, speech and occupational therapy everyday. It was only little over a month ago when we were concerned about whether Tara would be able to be admitted to a Rehab Center program because the requirement was that she had to be able to actively participate in therapy for 3 hours a day. Tara's will and determination have shown us that our fears were unfounded. Media Alert !!! - One week from today, Tara and Josh may be on ABC's Good Morning America show. We will keep you posted here as to the possible time slot. All of our readers will be able to tune in and see Tara on live TV..
Don't forget the next that will take place on Monday, August 16th. The Golf Tournament will be held on Monday, August 16th at the Santa Teresa Golf Course, in San Jose, California. If you would like more information please e-mail Miki Masuda at MMasuda@calvarylg.com or phone Miki at 408-356-5126, x244. Please tell you avid golfer friends about it and we still need some additional corporate sponsors to sponsor holes for the tournament. Side note: Tara's brother Chris and father John are seeking a one or two bedroom rental in the south bay area. If you know of one, please let them know via Email with a subject line of Rental. Thank you! 6:00 am GOOD NEWS!!! No new update this morning. We are still too happy that Tara walked yesterday! General housekeeping: The status page has been getting larger, and taking more time to download for our dial-up readers, so we have broken the status into monthly reports. You can click on the links at the top or bottom of the page if you wish to review status reports from previous months. Please sign our GUESTBOOK if you haven't already. See how you can HELP. Thank You! 4:00 pm GOOD NEWS!!! Tara walked approximately 50 feet in a hallway today, with her physical therapist in front of her to help in case she needed assistance. Tara did great! Good job Tara! 6:00 am Tara had a good day yesterday. She had her normal therapy sessions and then participated in the filming of a video for the hospital to document activities in the rehab center. She did a great job as she was interviewed with her physical therapist and her attending physician. Tara also received a newer and smaller knee brace. She needs the brace due to the damage done to her left knee from the accident. Her older brace rubbed on the donor site on her thigh where the skin graft for the burn on her forehead came from. The fact that both knees were injured in the accident is slowing Tara's progress towards being able to walk. The totals are in for the Car Wash and Bake Sale that was held at Calvary Church a week ago. The tournament was able to raise $3,101. for Tara's Recovery Fund. Once again, a very special thanks goes to Melissa Hammond who is a member of the High School Group at Calvary Church of Los Gatos for organizing the car wash and bake sale. Thank you also for all the volunteers who washed cars and baked delicious goodies, and thank you to all those who donated and now have cleaner cars and ate all the baked goodies. 10:00 am There are some amazing stories on the Rehab floor at Valley Medical. Each of the patients here has one. One in particular is Kathleen Davey, who is in a room just three doors down the hall from Tara. Kathleen had a cardiac arrest on Sat. morning, January 24, around 10 a.m. Her 6–year-old daughter called 911. Police arrived at the house within around 3 minutes of the call and administered CPR. An EMT unit then arrived and revived her heart with a defibrillator and rushed her to Valley Medical Center in San Jose. Kathleen has been in a coma since. Please take a moment to click on Kathleen's website and say a prayer for Kathleen's recovery, and for her husband Mike and daughters Samantha and Rachel..
6:00 am Tara had a good day yesterday. When asked what she did, she said that she went swimming and played badminton. In reality, she played some ping-pong from her wheelchair. The confusion associated with head injuries often persists for a long time. Tara also had several visitors yesterday from her church and high school, including Julie, Alexia, Amanda and Ashley. 6:30 am Tara had a good day yesterday. Her nurse Sandra, who has been providing head injury rehab for 18 years, says that Tara is making very good progress. Tara did not have any therapy sessions, as Sunday is a day of rest at the hospital. Her father once again explained what happened in the accident (see yesterday's "anniversary" status) and then took her for a long ride in her wheelchair outside the hospital, however, by evening Tara did not remember that he had visited. It is quite common for head injury patients to have difficulty with short-term memory. Tara also had several visitors yesterday afternoon. The totals are in for the Golf Tournament that was held in Colorado two weeks ago. The tournament was able to raise $12,328. for Tara's Recovery Fund. Once again, a very special thanks to organizers Terri and Tim Walsh, the Summit Community Church of Highlands Ranch, Colorado, everyone who volunteered their help and everyone who participated. Don't forget the next that will take place 2 weeks from today. We need some additional corporate sponsors to sponsor holes for the tournament, so please ask your management at work if they would be willing to sponsor a hole and have them give Miki a call. Miki hopes to find a corporate sponsor for each hole so there can be a sign at each hole. 12:30 am Today is the two-month anniversary of the tragic accident on Interstate 15 just south of Salt Lake City. Tara and Josh were driving home to their new married life in Colorado, after being married ten days before on May 22nd at in California. Tara was driving southbound in a construction zone in their Suzuki Grand Vitara SUV, having just bypassed the city. At the same time, Thad Goodman from Taylorsville, Utah was driving his Chevrolet Cavalier northbound on his way home to have lunch with his wife Susan, and their two girls, Hannah, 2 1/2, and Ivy to celebrate Ivy's 6-month birthday. For a yet unknown reason, at about 1pm, Thad lost control of his car, swerved several times and then rolled across the center median of the highway into the southbound lane. His car was upside down and airborne when it struck Tara and Josh's car. Click here to see the accident diagram by the Utah Highway Patrol. Thad was killed on impact and his car exploded creating an inferno with 15 foot flames. The cars spun and came to a stop with Thad's upside-down burning Calvalier pressed against the passenger side of the Suzuki, trapping Josh in the car. Josh could not get out through the door. He saw that Tara was unconscious and pinned in her seat. Josh punched his way through the partially cracked windshield, fracturing his knuckle, and climbed through the small opening. He was assisted out of the crushed vehicle by 18 year old Brad Beckstrom, one of the witnesses to the accident. He cried: "My wife, my wife is trapped." The wind was blowing the flames from the burning vehicle into Tara's car which also ignited. Hollywood tells us to run away from a burning vehicle, but several heroic witnesses from other vehicles came to Tara's aid, running towards the fire in order to help. Linden Curry stopped his 26-wheel, two-tank gas hauler just in time to avoid careening into the crash. He took two fire extinguishers from his rig and handed one to Brad who used it on the Suzuki while Linden used the other on the Cavalier. Jeremiah Richards used the water from his cement truck to try to dose the flames. Realizing that the fire would soon kill Tara, Andy Finlay from Herriman, Utah jumped into his new pick-up truck and drove into the flames to separate Tara's car from the other burning vehicle. At first, the Suzuki would not move, so Andy backed up and then lightly rammed it and was able to move it about 12 feet away. The witnesses continued to extinguish the fire on the Suzuki and then worked together to help Tara until the fire department rescue and paramedic teams arrived. The teams had to cut the Suzuki apart in order to extricate Tara who was then flown by emergency helicopter to the University of Utah Hospital. Josh was taken by ambulance to the hospital where he was treated for a broken collarbone, the fractured knuckle in his hand and multiple bruises. Tara suffered a head injury, burns to her face, a torn diaphragm, lacerated spleen and kidney, fractured toe, deep lacerations to both of her knees, and multiple cuts and bruises. Tara remained in a coma for 6 weeks, and is now making a remarkable recovery. Tara, Josh, their families and friends want to once again thank those that saved Tara and Josh's lives. Thank you Andy, Brad, Linden and Jeremiah. Thank you to all the Troopers, Fireman and Paramedics. Thank you to the physicians and nurses. Thank you to all who have prayed and all who have generously given financial donations. Tara is aware of what happened, is grateful to be alive, and hopes to meet her rescuers some day.. If any there were other witnesses to the accident, we would very much like to hear from them by emailing us or signing our guestbook.